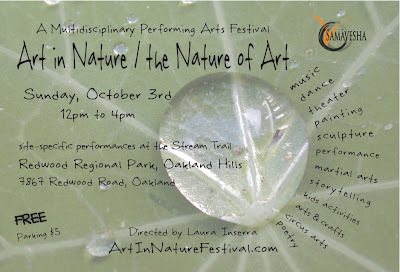 Here are details for Sunday's Art In Nature Festival happening at Oakland's Redwood Regional Park. You may have met Laura Inserra at the CELLspace Expo for Independent Arts. She has put together an awesome festival with 100 musicians and artists participating in this interactive day! It will also be home to the next Crafters Local 415 make 'n' take gathering! Laura's invited me to set up some crafty supplies, share some techniques, and just enjoy making stuff with you all. Look for other artists from the CELLspace expo as well! There will be no food vending or sales that day. It is a purely free and interactive event. What project are you working on now? Can you bring some knitting or collage materials and enjoy making art in nature? And pack a lunch too! 1st annual FREE multidisciplinary performing arts Festival conceived for the Stream Trail of Redwood Regional Park, Oakland, California. and directed by renowned Italian composer and artistic director Laura Inserra. tucked among the meadows, redwoods and oaks in this brand new family friendly (and bicycles & dog friendly) Festival. circus arts, theater, painting, storytelling, arts, crafts and kids events put on from Noon to 4pm.